Smartwatches are all the rage these days and this is unlikely to change any time soon. IDC’s latest wearables market forecast sees smartwatches continuing their ascendence at the expense of fitness trackers in the coming years. And while at 8.2% this year growth will be slightly lower than in 2017, it is expected to return to double-digits from 2019 to 2022. With each new iteration, the Apple Watch is edging closer to becoming your must-have health guardian. Series 4 comes with a bigger display, a slate of new health and fitness features, performance upgrades and more. Samsung, on the other hand, has recently unveiled its stylish Galaxy Watch, an updated version of its ageing Gear line. It comes with LTE connectivity, comprehensive fitness smarts, GPS and water resistance. For those in the market for a smartwatch, the two are arguably your best options right now. Here’s a run-down of their features. The Samsung Galaxy Watch does not look all too different from its predecessor, the Gear S3. But with its circular stainless steel case, decorative bezel and slight design changes the timepiece is more sophisticated. Plus there are a few more options to choose from including a Silver, Midnight Black and Rose Gold model. The timepiece comes in two sizes, a 42mm variant and a 46mm variant, whereas Gear S3 only came in the 46mm version. Both iterations sport a round 360×360 pixel, touchscreen, OLED display, although the 46mm version comes with more screen real-estate – 1.3 inches versus 1.2 inches. Whichever size you choose, there’s a rotating bezel, which turns very smoothly. Most will find this an easier way of navigating the on-screen menus than the Apple Watch’s rotating digital crown. The bands are interchangeable and there a number to choose from. This includes the Onyx Black, Lunar Grey, Terracotta Red, Lime Yellow, Cosmo Purple, Pink Beige, Cloud Grey, and Natural Brown. The Apple Watch looks nothing like the Samsung Galaxy Watch. The most obvious difference, of course, is its rectangular design. The gizmo sports an edge-to-edge screen with new display technology called LTPO that improves power efficiency. The actual dimensions of the device are still the same but the screen real estate is larger by 30% on both the 40mm and 44mm version. Series 4 is also slightly thinner than its predecessor and comes in at around 30 grams which is about half the weight of the Samsung Galaxy Watch. This makes it more suitable for those with smaller wrists. Its back is made of black ceramic and sapphire crystal on all versions of the device. This type of material helps with cellular connectivity. You can choose between the silver, grey or gold case options. There’s also a Nike+ version in silver and space gray aluminum, and the Hermes collection in polished stainless steel. Apart from the shape, a major difference between Apple’s and Samsung’s devices is the screen. The Apple Watch display is off by default and there’s no way to change this. The Samsung Galaxy watch, on the other hand, has always-on display support. Nevertheless, most would agree that Apple’s device is easier for reading and interacting with apps. In terms of actual specs, the smaller Apple Watch has an OLED Retina 759 sq mm display area (324 x 394 pixels), and the larger a 977 sq mm screen (368 x 448 pixels). All things considered, in terms of aesthetics and design we would put Apple Watch Series 4 slightly ahead. But Samsung’s wearable is a looker and a decent improvement on its predecessor. It will definitely be better suited for those who are after something that actually looks more like a watch. Under the hood there are a few important differences to be aware of. The smartwatches share an optical heart rate monitor, 3-axis accelerometer, gyroscope, altimeter, vibration motor, ambient light sensor and built-in GPS. Both also come with an LTE option for cellular connectivity. But Apple Watch Series 4 also comes with a ECG sensor. It is capable of letting you know if your heart rhythm is normal or there are issues. The Cupertino outfit has also upgraded its accelerometer and gyroscope and these can now sample motion data 8 times faster. This allows for nifty features such as fall detection. Powering everything on the Apple Watch 4 is its S4 system on a chip. It boasts a 64-bit dual-core processor and W3 Apple wireless chip. Galaxy Watch, on the other hand, runs on the Exynos 9110 dual-core 1.15GHz chipset. In terms of memory, the Apple Watch has 512 RAM and 16GB storage. The Galaxy Watch comes with 768MB RAM and 4GB storage on the Bluetooth-only version, and 1.5GB and 4GB storage on the LTE model. Apple’s technical specifications suggest the battery will keep its smartwatch going between one and two days on a single charge. That was perhaps to be expected considering the bump in specs, but it continues being a problem for many, dare we say most. Samsung seems to be right on top of things on this count. The company says its Galaxy Watch comes with around 7 days of battery juice for the 46mm version and around 3 days for the 42mm one. In reality you’ll find that battery life is slightly lower. Nevertheless, its still decent especially considering that these figures are with the always-on screen option switched on. When it comes to water-resistance both of these wearables will do the trick. Galaxy Watch and Series 4 come with a fantastic 5 ATM water-resistance rating allowing you to dunk them down to depths of 50 metres. They can also monitor your swim sessions with appropriate statistics. Although the watches are all-rounders, they are also quite good when it comes to fitness tracking. You’ll get everything you need when it comes to keeping tabs on your fitness around the clock. This includes steps, distance, calories, floors climbed, active minutes and more. The watches also come with move reminder and some more advanced performance metrics such as VO2 Max. Then there is built-in GPS. This is particularly important for those who appreciate phone-free exercising. The built-in storage for music allows for a complete phone-free experience. In terms of apps, the Apple watch comes with the Activity and Workout app. The former monitors your daily routine, the latter your exercise (running, cycling and more). Everything is also synced to the Health app, ensuring you have a record of your activity and health in one central location. The Galaxy Watch also has a great fitness app which is easy to navigate. Just like the Apple Watch, it automatically recognizes common workouts. Thanks to its water resistance, this also including swimming. You can expand the list of the default 6 types of workouts it recognizes by setting things up your self and choosing from an overall total of around 40. The most obvious advantage of Samsung over Apple is sleep tracking. Put simply – Galaxy Watch has it, Apple Watch Series 4 doesn’t. You can, of course, opt for a third-party app. But the fact remains you’ll be charging the Apple Watch so often, sleep tracking will not be an easy feat even with third-party software. The other fitness benefit of the Galaxy Watch is that it uses its heart rate monitor to keep an eye on stress levels. It will give you an alert to rest if it sees a spike in your heart rate which cannot be attributed to exercise. Just like the Apple Watch’s Breathe app, you can then use Samsung’s breathing exercises to get your heart rate down. Finally, there’s also rep counting on the Galaxy Watch. This may pique the interest of gym rats. We’re not particular fans of this functionality on smartwatches as we find it slows things up when working out. While the Apple Watch doesn’t have the above mentioned functionality, it does come with a few tricks of its own. The first is its widely publicized ECG sensor. To take a reading rest your finger against the digital crown. This creates a closed circuit with the sensor on the back. You’ll get a full report in the new ECG app that will let you know if your heart rhythm is normal or there are issues. The functionality is due to be enabled later this year in the US and than, pending regulatory approval, in other countries. Time will tell whether the ECG functionality is actually useful or if it creates lots of needless worries with false-positives. Another health novelty is the trip and fall functions. There is more than one way to have such an accident and Series 4 can identify a number of them based on your wrist trajectory and impact acceleration. This in turn activates a few options for dialing emergency and notifying your loved ones with your location. The Apple watch also has FDA-approved irregular heart rate alerts. Although you won’t get a warning if you’re stressed out, the gizmo does monitor for unusual high or low heart rate with alerts to match if it suspects there is something wrong with your ticker. Both of these devices are fully fledged smartwatches and shine on this count. They come with storage for music, NFC for payments (Apple Pay and Samsung Pay), and an LTE option for cellular connectivity. But an important difference between the two devices is the operating system. The Apple Watch runs on watchOS5, where are Samsung is using its own Tizen operating system. This means that Apple Watch will only play nice with iPhones, whereas the Galaxy Watch will work with pretty much any device. Mind you, the user experience will be best on Android phones as the integration is tightest. And if you’ve got a Samsung phone to two will get along swimmingly. That said, watchOS5 comes with many more apps than you’ll find on Tizen. This is because Apple’s software is supported by a larger network of developers. And while Samsung says its smartwatch has more than 10,000 apps, this figure includes watch faces. Which means that a number of popular apps are missing from Samsung’s platform. The watchOS Apple Store, on the other hand, truly has over 10,000 apps to choose from. 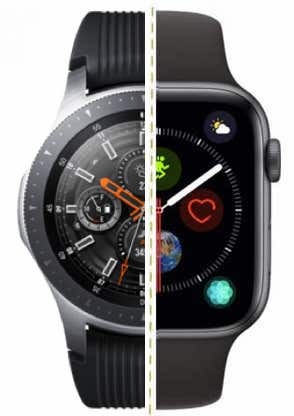 The Apple Watch Series 4 and Samsung Galaxy Watch are probably the best options for those looking for a fully-fledged smartwatch. But choosing a winner is not easy. Things that work in Samsung’s favor are superior battery life, sleep, rep and stress tracking. If you prefer your smartwatch to look more like a watch the Galaxy Watch is the better option, even if it will be a bit too big for many. Its also worth keeping in mind that Samsung’s device is slightly cheaper. The Apple Watch, on the other hand, has a plethora of health related features, offers a more polished user experience and has a wider range of apps to choose from. There are more design options and it is more likely to suit those with slimmer wrists. Ultimately, we suspect the decision on which device people choose will depend a lot on whether they’re an iOS or Android user. Samsung’s Galaxy Watch will probably be a favorite for Android users. For everyone else, the Apple Watch remains the obvious choice. If you are buying a watch for connectivity I swear by my LG watch Urbane its classy and does everything the Samsung does minus the fitness aspect. If you want an all round watch well it was supposed this one but it DOESN’T”T WORK, just google SAMSUNG GALAXY WATCH ISSUES you will see this is WORLDWIDE!!. I am getting refund even though I love the look and feel of watch but it just doesn’t work as advertised and SAMSUNG ARE ALL Shhhh (Quiet) ABOUT IT Until it does something like blow up they wont acknowledge the watch is not functioning properly. SAVE YOUR MONEY and wait for SAMSUNG TO GET THEIR ACT TOGETHER with the Galaxy watch and maybe purchase after all bugs are fixed. I am going back to my trust Fitbit with its accurate heart rate, step count sleep metrics and the trade off is i have to pick up my phone for emails GET YOUR $H?T together SAMSUNG and I will consider buying your watch again.